The Dr.UGraft™ central console is the unit which powers the foot pedal controlled water irrigation system. This revolutionary component enables FUE hair transplant grafts to be hydrated in a controlled drip fashion during the extraction process, protecting them from air exposure and any risk of drying out, the number one cause of follicular death during hair transplantation. 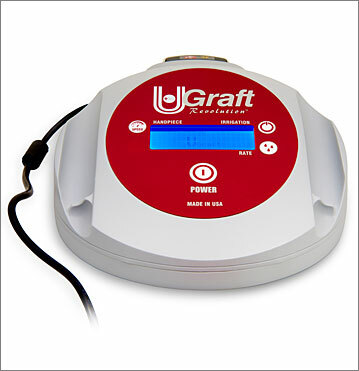 The foot pedal controls the water-led expulsion process to remove impacted grafts without the use of harsh metal forceps. 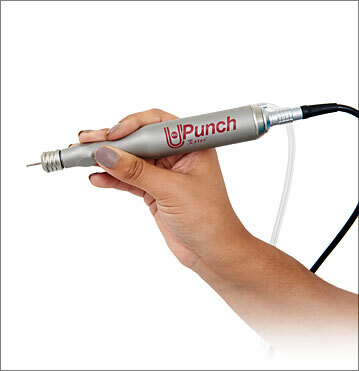 It can be attached to the Dr. UPunch i™ or the Dr.UPunch Curl™ handpiece. An advanced engineered handpiece that propels the rotation of the punch and directs fluid from an external source to the tip of the punch for expelling impacted grafts and adding drip hydration to the hair follicles during extraction. This highly intuitive unit is designed to enable safe, intuitive extractions while eliminating guesswork on depth penetration and the actual positioning of the follicle below the skin’s surface. 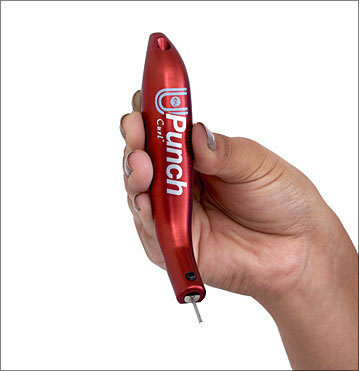 The DrUPunch Curl™ is a non-rotary punch designed for successfully harvesting the curled hair follicles of all patients with Afro-textured hair. The two-pronged curved blades of the punch unit replaces the need for cylindrical or barrel shaped punches to precisely follow and excise around the outer curled contour of these uniquely shaped follicles. The plunging and curved motion used during the extractions works with the unique structural design to then safely lift the follicle from the excision site. With the Dr.UPunch Curl™, all patients of African descent can benefit from successful and reliable FUE hair transplant procedures to experience their growth and coverage.